Students from the North East are far outnumbered on many degree courses – including prestigious subjects such as medicine and maths, according to a new analysis, sparking fresh concerns about equal opportunities. A Press Association investigation reveals regional divides in England in university acceptances – with the largest gulfs between those in the North East and London. The analysis of Ucas data on acceptances by English region shows that in general just over one in five (21%) students taking up degree places last autumn were from the capital, while just 4% were from the north east of England – a gap of 17 percentage points. But while some of this can be put down to variations in the population – London having around three times as many adults than the North East – the difference is markedly larger in some subject areas, with some of the biggest acceptance gaps for those that are likely to lead to high-flying careers, including medicine and dentistry, business and mathematical sciences. The figures come amid continued debate about a North-South divide, with concerns raised in some quarters about opportunities for young people living in parts of the North of England. One charity said the data paints a “worrying picture of a consistent and pervasive regional divide” in university access. The Press Association analysis shows that in 2017, 245 students from the North East (4% of all acceptances for the subject) took up places to study medicine and dentistry, compared to 1,585 London students (24%). This means that there is a 20-point gulf between the regions. 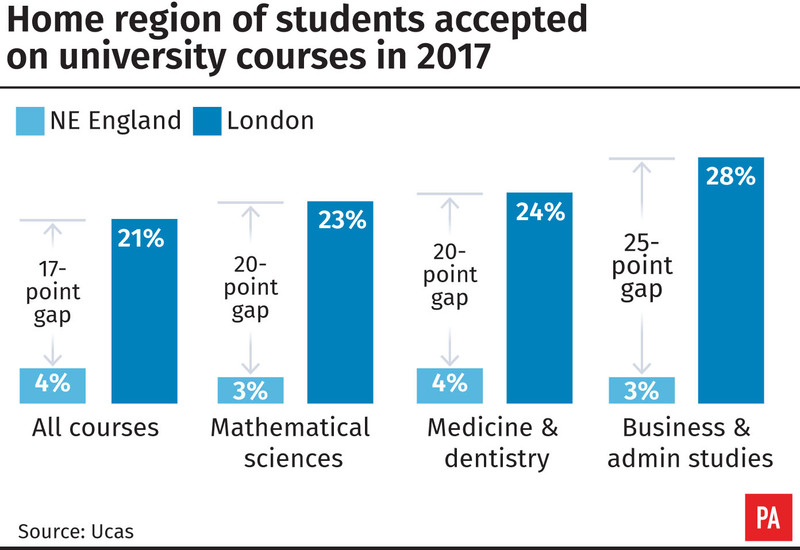 The gap is even larger for business and administration at 25 points, with just 3% of acceptances for this subject area coming from the North East (1,445 students), compared to 28% (12,645 students) from London. In addition, there were 190 acceptances for mathematical sciences from the North East (making up 3% of all students for this subject), compared to 1,520 from the capital (23%) – a gap of 20 points. Figures show that across all subjects, 16,420 students from the North East were accepted on to courses last year, compared to 81,385 from the capital. Gaps were also greater than the overall average in languages and social studies. In addition, the North East had the smallest proportion of students taking up places on veterinary, agriculture and related courses (135), while the South East had the largest (905 acceptances). He called for more use of contextual admissions – whereby universities take into account an applicant’s background when making offers – as well as more outreach work. Geoff Barton, general secretary of the Association of School and College Leaders (ASCL) said the figures “reflect a familiar and deeply concerning pattern of reduced life chances in parts of the country suffering from high levels of disadvantage and lack of opportunity”. “Schools in disadvantaged areas frequently face extremely challenging circumstances, struggling to recruit and retain teachers and leaders, and too often labelled as failing by a draconian accountability system which stigmatises them. “These areas and their schools need more targeted support. We welcome the government initiative to boost education in 12 opportunity areas in England, but it is nowhere near enough. There are no opportunity areas in the north east, for instance. A Department for Education spokeswoman said: “Universities should be open for everyone with the talent and potential, regardless of their background or where they live. More people than ever before are going to university and entry rates for 18-year-olds from the North East increased by 26% between 2010 and 2017. She added that the government has launched a Northern Powerhouse Schools Strategy, and committed £70m to improving school performance in the north.